Once installation of XAMPP is complete, database MySQL is also ready to use. When you create a system where a database is used, you need to set up MySQL after having installed XAMPP. First, set up character set. 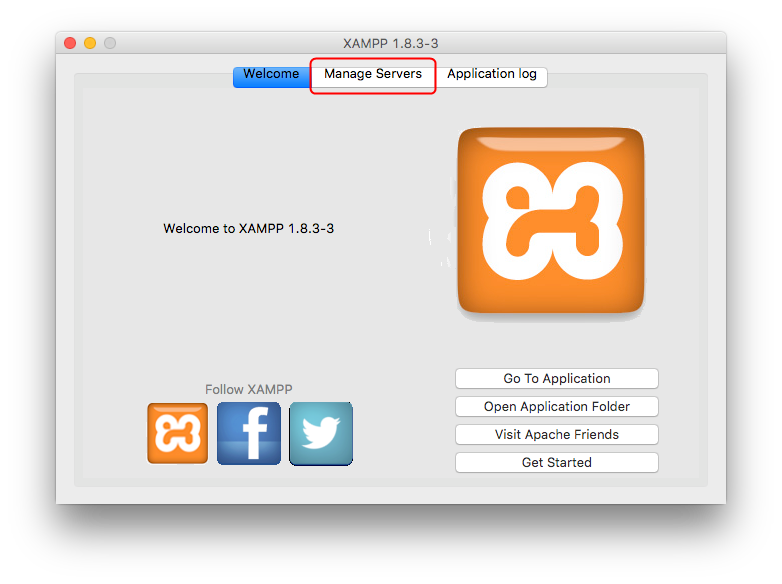 Select ‘etc’ folder in ‘xamppfiles’ in the installed XAMPP folder (if default setting, XAMPP folder is under Applications). The, open ‘my.cnf’ file by note pad. 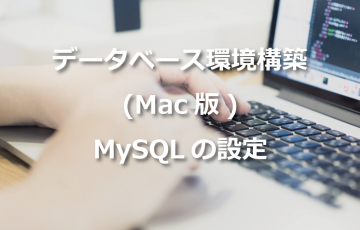 *If you modify some other lines by mistake, there is possibility that MySQL does not work. So, it is recommended that you copy the file “my.cnf” and save it for backup. 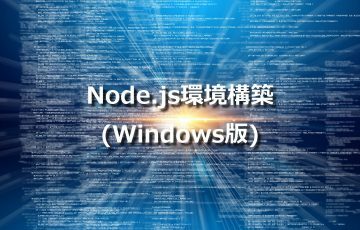 Modify 2 parts; [client] and [mysqlId] of [my.cnf]. By referring the following code, in [client] section, add [default-character-set=utf8]. And at the end of [mysqlId] section, add [character-set-server=utf8]. The following is the code after added. That’s all for setting up character set. Now let’s start to run MySQL! 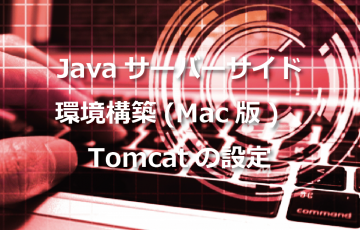 First, open the folder where XAMPP is installed (i.e. 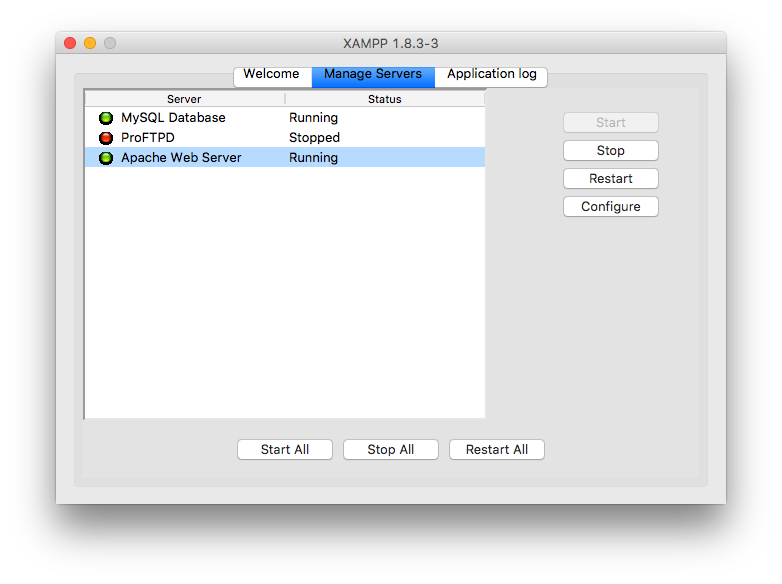 xampp folder directly under Applications by default). 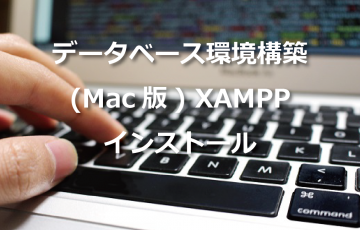 Double-click the file “manager-osx.app”, which is at the bottom of xampp folder. A panel window is displayed as below. Double-click “Manage Servers”tab. Select ‘MySQL Database’ and click ‘Start’ button at the right side and select ‘Apache Web Server’ and click ‘Start’ button. If Status shows ‘Runnning’ as below, start-up MySQL is complete. 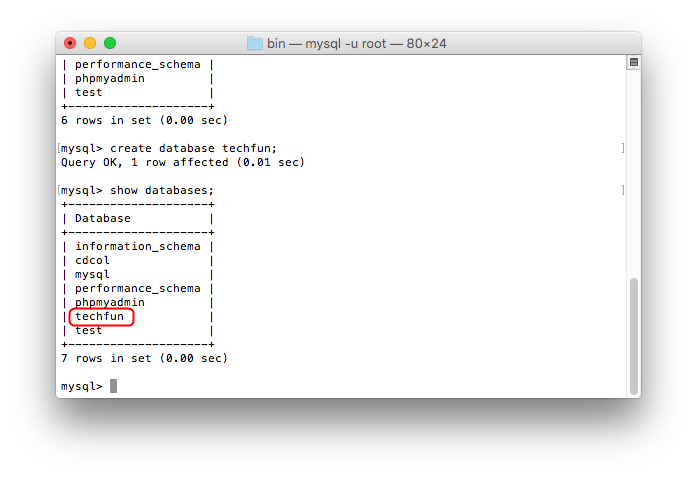 Now that MySQL has run, log in to MySQL and try some operations. 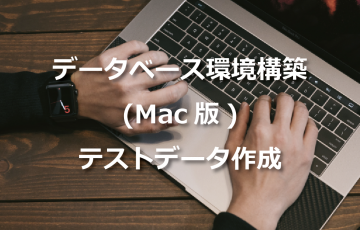 Select ‘Macintosh HD’=>’Applications’=>’Utilities’ and run ‘Terminal.app’. 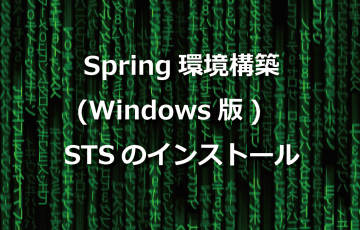 After run Terminal, the following window will open. 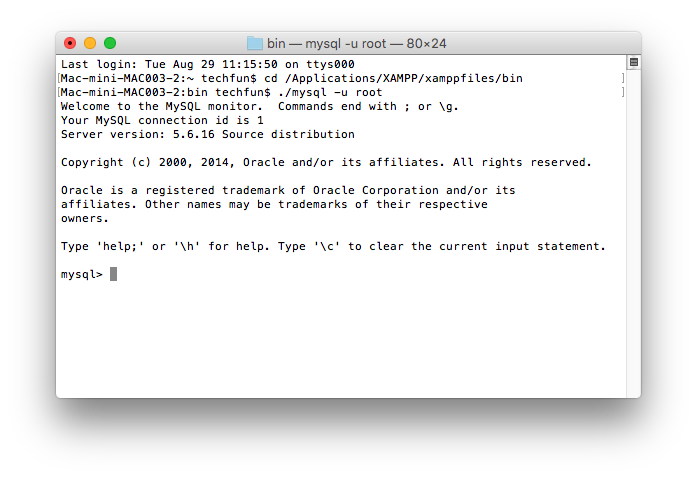 You will run MySQL by using this “Terminal”. 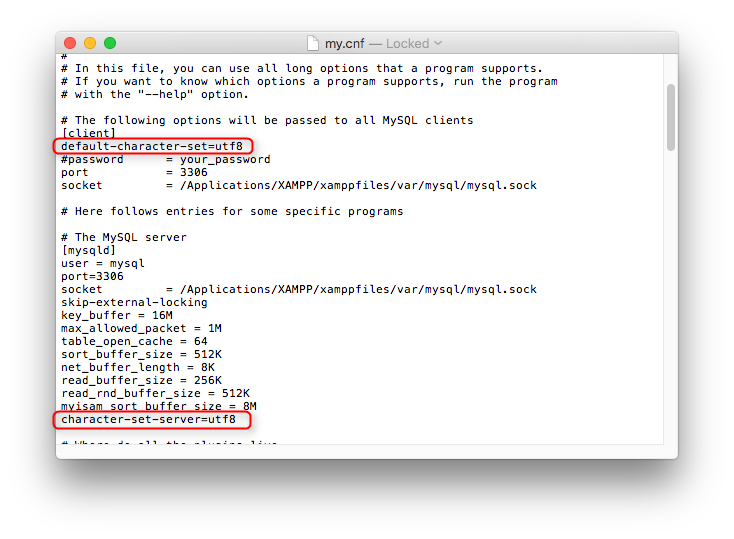 Then, follow the below procedures and log in to MySQL. To begin with, enter the command below after ‘ $ ‘ which is shown at the end on terminal screen, and click “Enter” key. “cd” is the command to specify which directory to move to. 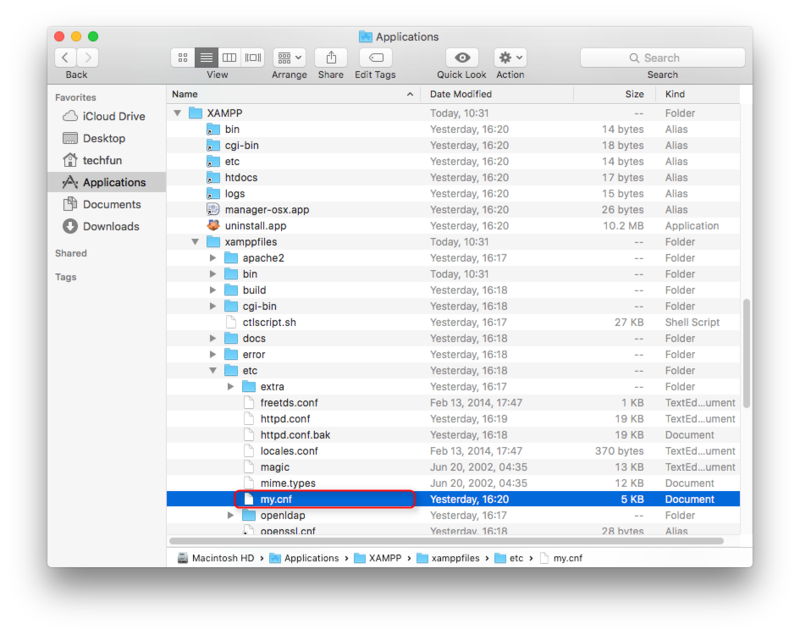 The above description specifies “bin” folder under “xamppfiles” folder under “XAMPP” folder under Applications. 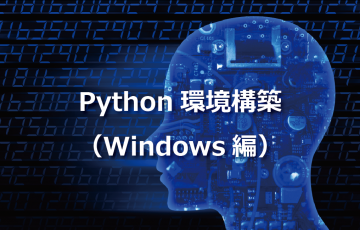 If you have successfully moved to the directory, the command prompt screen will be as below. Next, enter the command to log in to MySQL and click “Enter” key. Once you have successfully logged in to MySQL, screen will be as below. 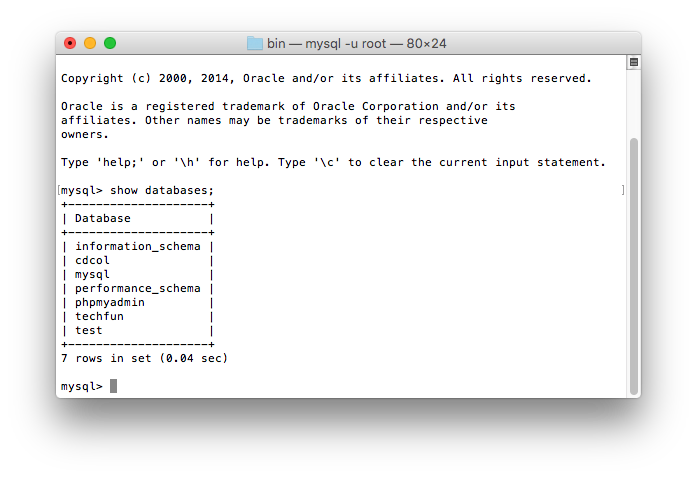 Enter an SQL statement after ‘mysql > ‘ to manipulate data in a database. Data management unit in MySQL is a database. 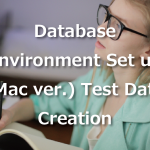 For example, when you collectively manage data in a book management system, you would need to store all the tables related to the book management system in the same “database”. 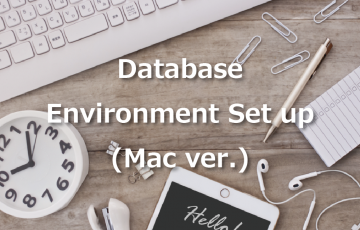 To begin with, let’s take a look at what databases are currently available in the MySQL environment. 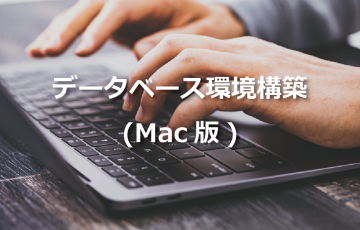 Enter the command as below and click “Enter” key. Then you will see the list of sample databases that are available from the beginning. Create a new database for your learning. 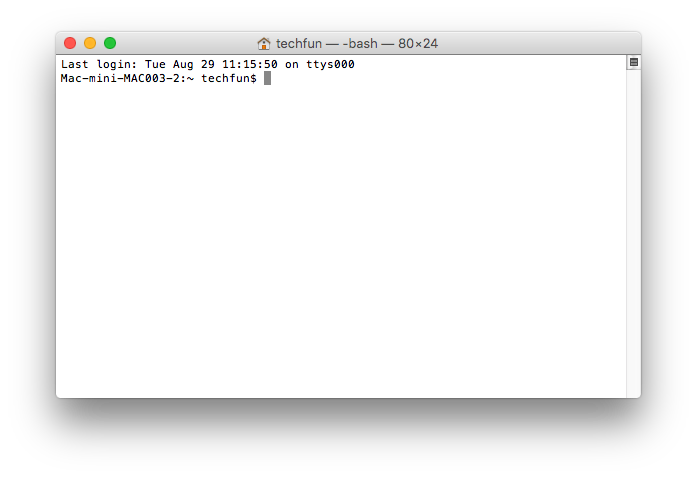 ‘techfun’ is the name of a database. You can specify another name, of course. 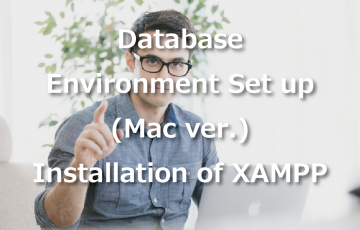 Let’s check if the specified database has been really created by running the command below. Do you see the database ‘techfun’ shown on screen? 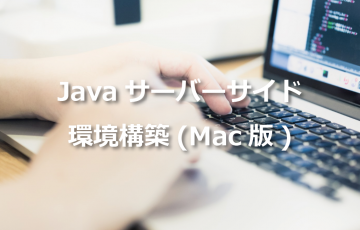 In StudySmile or Tech Fun.jp, please use the database ‘techfun’. A MySQL database is like a box to manage each collective data. 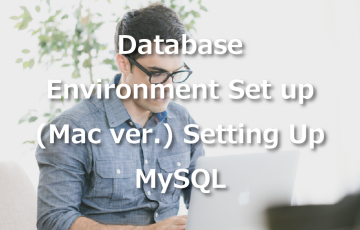 When you use MySQL, you always need to select which database to be used. 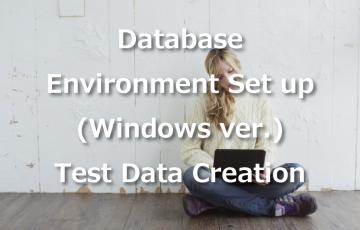 Select the database that you have just created. 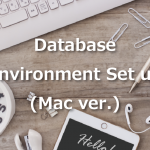 You can select the database to use by running the command below. 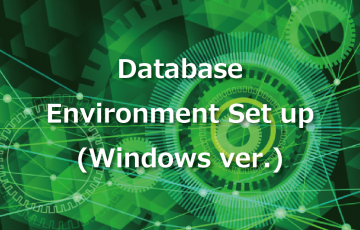 If you see the message “Database changed” on command prompt screen, it indicates that the specified database has been selected with no problem. How to enter a long SQL statement. When you enter commands on command prompt, it is possible to insert line feeds in the middle of a statement. For example, if you enter ‘mysql > show databases’ without a ” ; ” at the end and press “Enter” key, command prompt screen will be as below. This means that one statement still continues. When you enter ” ; ” after an arrow and press “Enter” key, the command runs. This function allows you to divide a long SQL statement into several lines by inserting line feeds. 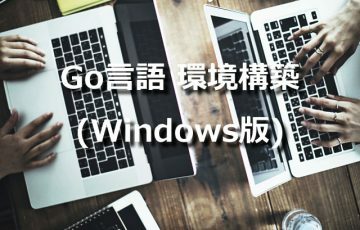 You will get the same execution result from this way of writing a command. That’s all for setting up MySQL. 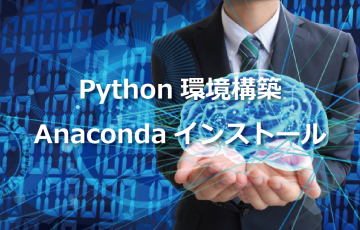 If you are a learner in StudySmile or Tech Fun.jp, please move on to Test Data Creation.